Soaring high in the sky... AMAZING and LOUD! I'm sure there is screaming via Nikki... I think I can hear all the way from the East Coast! Congratulations!!! Paintings will get underway today and your Frameable Notecards will be on their way soon! Please email me your addresses. If you did not win... don't be discouraged... I will not be discarding the rest of the photos BECAUSE I will be doing a weekly drawing until the end of the year... SOOOOO... you actually get more than 1 chance! AND NEXT WEEK I WILL BE DRAWING ANOTHER WINNER! For those of you who have not entered my Ooh la la Giveaway... Send me a LINK to your favorite photo (only 1 photo please) or an email and don't forget to leave your EMAIL... and I will randomly draw a winner... then I will paint your photo and post it on my blog and YOU WIN A SET OF FRAMEABLE NOTECARDS OF YOUR PAINTING... WHICH WILL BE SENT TO YOU VIA SNAIL MAIL! Deadline for the Ooh la la Giveaway is Friday the 12th Midnight PST. Ohh so pretty - you are lucky to have such a lovely view! 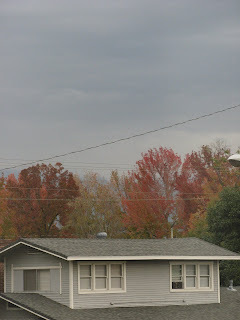 fall is almost over here as the last gasps of yellow and red cling to the bradford pear trees. ok, first, fall arriving? seriously? we have inches of snow...so, for that, i am sooo stinking jealous of you! i've never seen a stealth in the air, weird...looked PS'd in or cartooney! Morning, Fifiness! 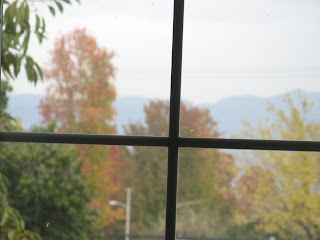 Lovely fallness out of your window!! I would love a little of that color around here! GREAT choices for your contest, FIFI.....I will try, try again!......Thanks for visiting me!!! Congrats to the winners; I am sure they will enjoy them once they receive because you are awesome! Oh congrats to the winners. I love that bedroom scene, that will be great painted. I am wondering if they were practicing also in that stealth for the Rose Parade coming up? that's only about three weeks away isn't it? They usually have them fly over at the beginning. Your view from you studio is nice with the trees and mountains in view. 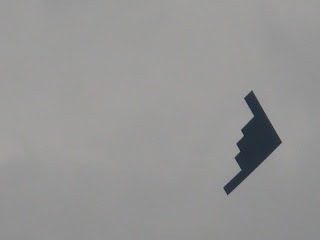 Um... stealth bomber... not too stealthy, me thinks... Love the bedroom! Pretty nice view, enhancing our artistic imagination! Yay! I'm excited! Thanks for picking my photo! lovely image from your studio window. Fall has arrived. I am so happy that I have an extended autumn this year, since i am in LA visiting from chicago. It was snowing when I left. i am enjoying this fabulous weather. A stealth bomber?! What craziness... Lovely fall photos Fifi! Fall just now? 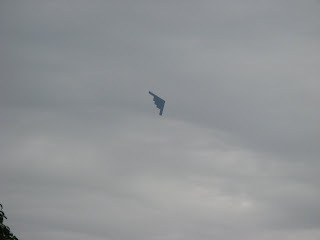 Stealth Bomber circling?! What kind of crazy place are you at?! Congrats to the winners! hmmmm what happened to my comment...did you have to delete it because of all the screaming lol...did I wake up your neighbors?? Or did I just forget to hit the "post comment" button because I was so FREAKING EXCITED!!! oh wait....there it is. Ignore me...I'm in a daze from my excitement...that and I'm always a big doofus. so pretty, yea for the winners... I still need to take time and send in a picture I never win anything but it still would be fun to try. I also need to take time and look at your paintings again I just love them all! have a great fall day while it lasts. I'm in Detroit and last weekend while driving a to friends house there was a stelth bomber overhead. A bit freekie, but we are near Selfridge Military base. I've never seen one fly over though in the 8 years I've live here. 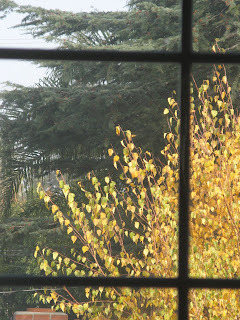 Beautiful trees, you must get so much inspiration right out your window. What a great contest and lucky winners, will you show us what you do? Hope so! We are definitely into winter here. Brrrrr...it's cold! Congratulations to the Winners. 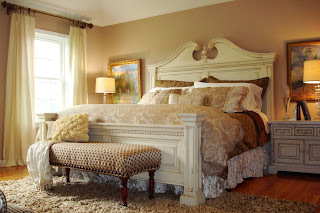 The bedroom photo is beautiful and will look gorgeous when you paint it. You have a gift for making L.A. look lovely. Hope you're enjoying fall at long last! What a wonderful idea! Congratulations to the winners! I'll send a photo too! LOL - Nikki is very excited, methinks. We can definitely hear her down here in Texas, despite the thunderstorms. : ) Beautiful fall colors, Fifi, thanks for sharing your art with us. Stealth bomber?!?? ODD and SCARY!!!! I tried to post a comment on your most recent post (with the lady in the red dress) but no white box appeared. So I'm saying it here: Great painting! How did I miss this giveaway!?!?!?!? I'm very happy for Nikki!! She deserves it..